The remote security server secures ticketing transactions from multiple channels (TVM, agency, sales to remote server, etc.) in a centralized way. Flexible, it process all transactions with Calypso portabl objects and contactless tickets. Flexible, the server manages transactions between cards and terminals. Terminals relay the exchanges with the portable object in their raw format, the remote security server decodes them, interprets and sends the appropriate responses. 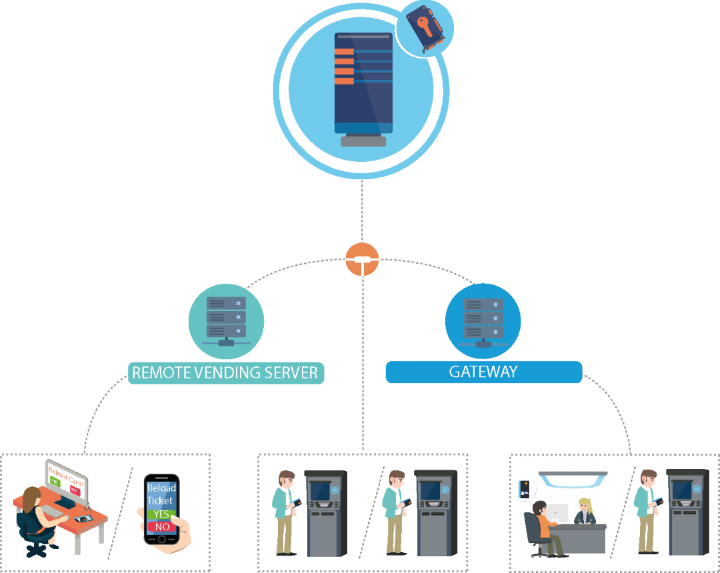 Connected to a remote vending server, it facilitates the addition of new distribution channels for your users by requiring only to parameter and update a single server. Compatible with the latest calypso specifications, the server ensures the security and authenticity of your ticketing transactions on all media. The remote security server fits easily into your existing systems thanks to its flexible communication interfaces. The modular server adapts to your system and objectives. Our team helps you in defining its features.